As nurses, when we enter a patient’s room, we are expected to immediately get into a relationship with the patient to create trust. The patient then shares their most intimate medical history along with their pressing problems. We meet them when they are in their most vulnerable state and enter into a most personal aspect of their lives. It is important to share gratitude for being able to do what we can in caring for the people who we serve. We are privileged to take care of patients because we are nurses. In doing so, we are honored to serve in this fashion. Being a nurse gives us so many privileges for which we need to be grateful. When I wake up each morning, I choose at least 3 things that I am grateful for. To be honest, there are a few days I felt grateful only for waking up and breathing. The other mornings I am grateful for everything. If you begin your morning in gratitude, the day is so much nicer and easier because you are focusing on what is good and not what’s bad, what’s working rather than what’s not working. 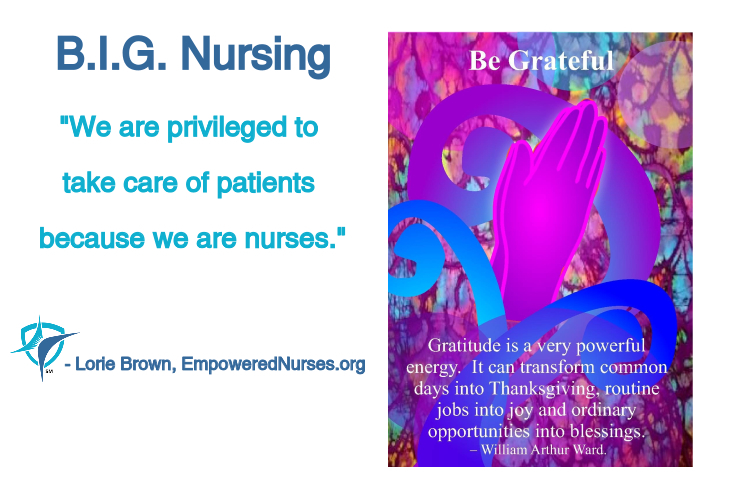 How would it go if we began each nursing shift in gratitude? I encourage you to try it and you will see that your shift will go much smoother by being in gratitude. As a gift for you, I would like to share my Clarity Cards. There is now an app I created which can be downloaded at no charge. They’re available on the iTunes or Google Play stores by searching for “empowered nurses.” This will inject positivity into your day to help you to get clarity when you need it. Now, tell me how you express gratitude. Do you begin your shift in gratitude?